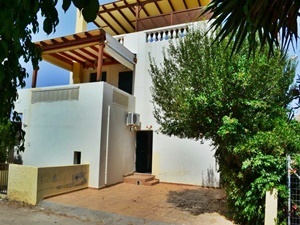 This is a new building containing a superb 3 bedroom maisonette villa, and two two bedroom houses with separate entrances. 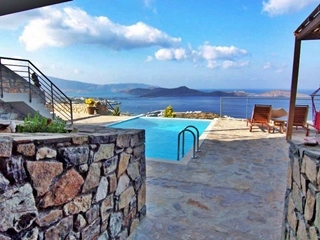 They have stunning views and private pool and parking spaces and are situated near Ag Nikolaos. 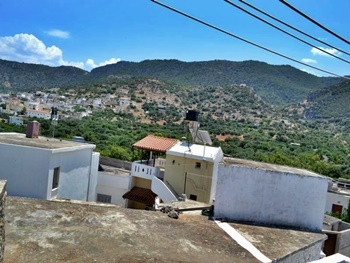 They are 5km south of Agios Nikolaos town, near beautiful sandy beaches and the Vathi Pine forest (one of the largest pine forests remaining in the area). 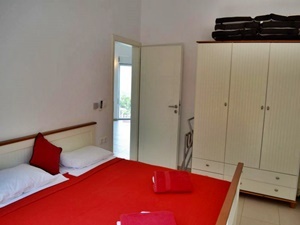 Ground floor : 2 large bedrooms both en-suite, the one with a walk-in wardrobe. A marble staircase leads up to the first floor, which has a large open plan kitchen, living room, dining room and a small w/c. 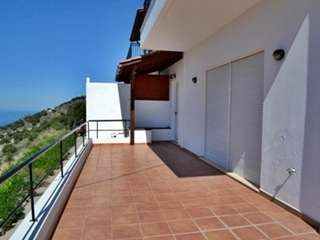 Also, this floor has access to three large terraces with views over the Vathi forest and the Mirabello bay. 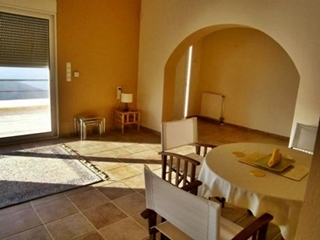 Second floor: This floor includes the master bedroom with its own bathroom, walk-in wardrobe and large balcony facing the Mirabello bay.To the east of house is a nice sub deck area with a good sized swimming pool. 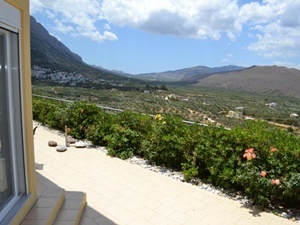 The villa has its own private parking spaces and garden areas and has good road access. There are Air Conditioning units in all bedrooms and living spaces. 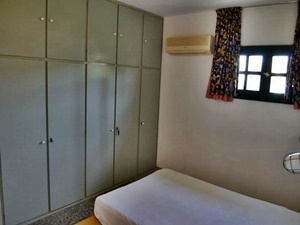 There is full central heating, and double glazed aluminium windows and balcony doors with electric shutters and mosquito screens. A solar panel heating system is installed. 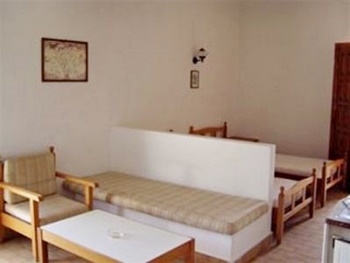 The two bedroom houses are very similar in quality and design, and each has its own entrance and parking space. 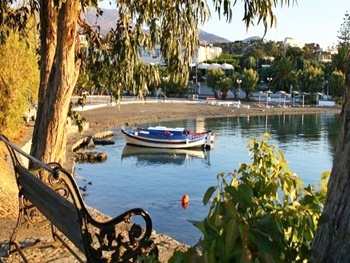 Vathi is a very pretty area south of the town of Agios Nikolaos.It is sparsely built but has been developing as a high market area in the last few years. Two luxury hotels have been built in the area recently. 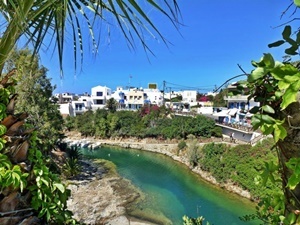 The cosmopolitan town of Agios Nikolaos is only 7 kilometers away, while the beach resort of Istron is only 4 kilometers North. The new 5 star Hotel Grand Melia has made access to a lovely organized sandy beach which is open to the public. 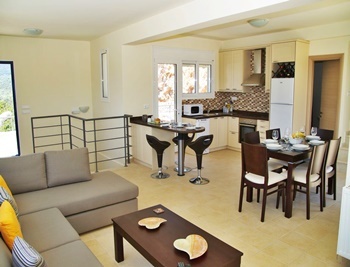 The international airport of Heraklion is less than an hour's drive from Vathi. 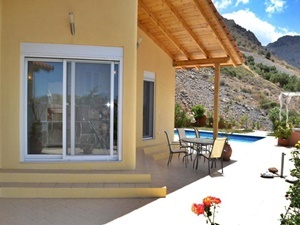 A beautiful 2-bedroom bungalow with swimming pool and sea views. 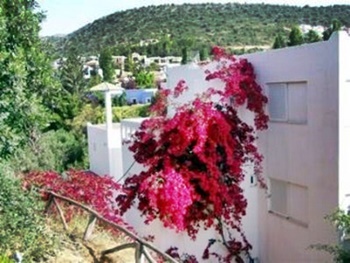 The house is in the lovely area of Tholos beach, near the traditional village of Kavousi, built on a plot of approx. 1200 sq. meters. 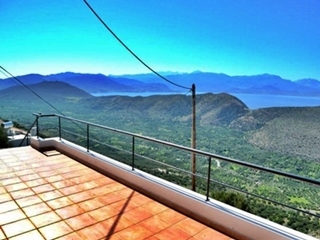 The property is in an elevated position, offering great sea, mountain and valley views. The bungalow has its own 28sq meter tiled swimming pool with a large tiled swimming pool terrace, a brick-built BBQ, parking spaces, tool shed and garden space. 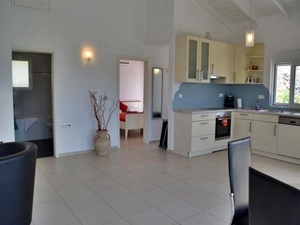 This 70sq meter villa comprises 2 double bedrooms with fitted wardrobes, a bathroom with bathtub and an open plan kitchen/dining room with modern fitted kitchen with appliances and a fireplace (with glass door). The building is constructed to European standards with double-glazed windows that have insect screens and folding shutters, solar under floor heating, a floor cooling system, high ceilings with exposed timber beams, marble work surfaces and sanitary ware of high quality porcelain. 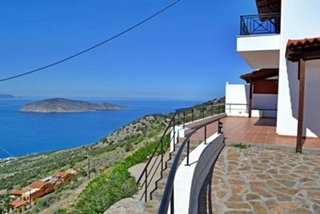 Kavousi is a coastal village set on the 25th km of the Aghios Nikolaos-Sitia road. 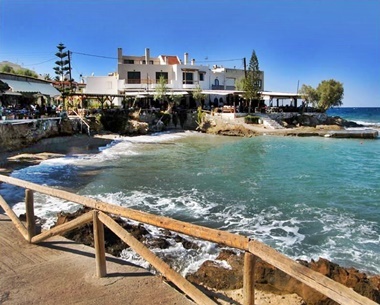 It has many shops, tavernas and the lovely sandy Tholos beach is a few minutes drive from Kavousi. The international airport of Heraklion is a 1 hour 20 minutes drive. 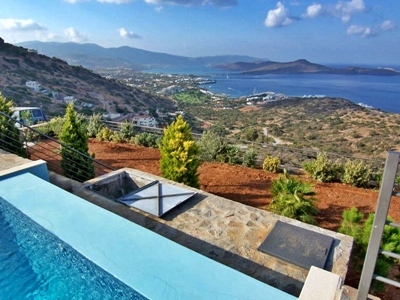 A very private villa built in fenced land of 3000sq meters near (within walking distance) the traditional village of Epano Elounda. 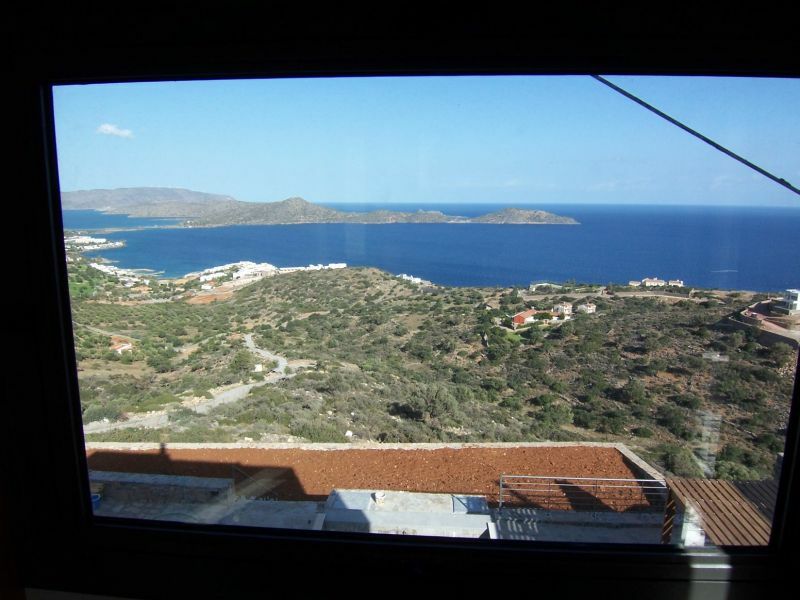 The property is on the side of a hill and enjoys great views of Elounda bay. 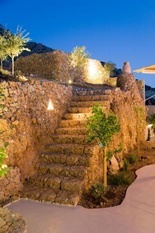 A remote controlled gate allows access to the property. The concrete surface in front of the house has enough space to park a few cars and there is also a garage (with a remote controlled door). This serves as one of the main entrances to the house. 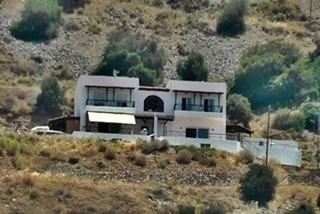 This luxury Villa is 210 square metres in a plot of 3000 square metres, with three bedrooms and three bathrooms. Year of construction 2006. An independent one bedroom apartment is on this floor. 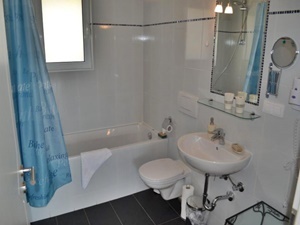 It comprises a large double bedroom, a kitchenette and a bathroom. A marble staircase leads up to the first floor. 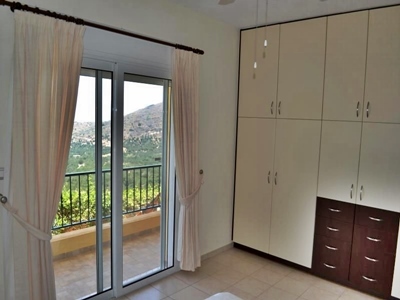 On this floor there is a large fitted kitchen with wooden wardrobes and a dinning area, a large balcony that also has access to the ground terrace, a double bedroom with fitted wardrobes, an office and a bathroom. 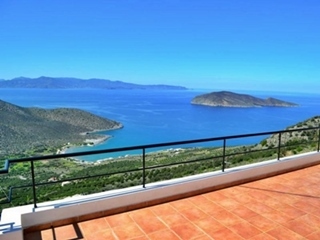 On the second floor there is a beautiful lounge area with access to a big balcony overlooking Elounda, Pano Elounda and the sea, a double bedroom and a large bathroom with a vanity shower. 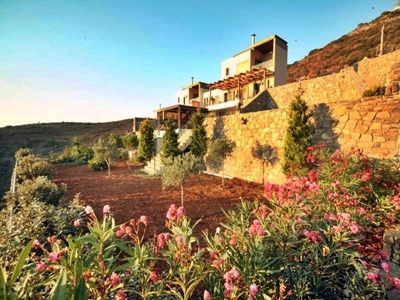 The land surrounding the house is landscaped and features an olive grove, a swimming pool with a sunbathing terrace, a good-sized Jacuzzi, flower gardens and stone paved paths. 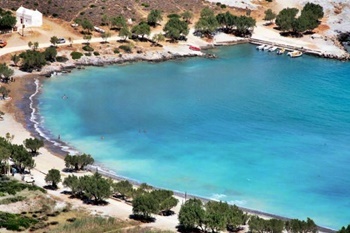 The resort of Elounda and many beaches are within a few minutes drive. 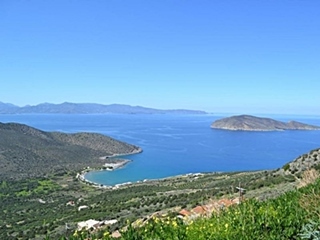 Agios Nikolaos (the province capital) is about a ten minute drive and the international airport of Heraklion is an hours drive from Epano Elounda. Elounda is a small fishing town on the Mirabello, on the island of Crete, Greece. 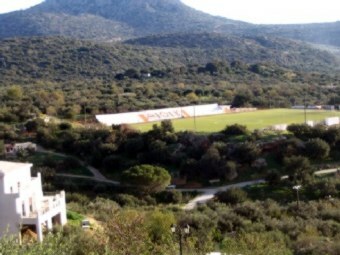 It is part of the municipality Agios Nikolaos. 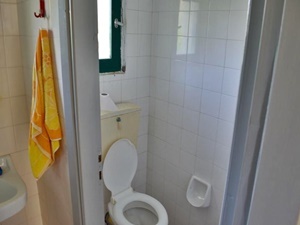 It is popular with European tourists and has several 5*hotels. 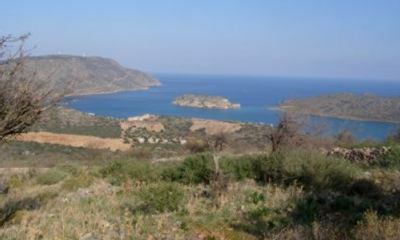 Elounda is also the closest major town to the former leper colony of Spinalonga. 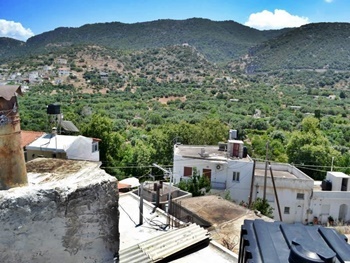 The town is near to the city of Agios Nikolaos and the village of Plaka (Lasithi). 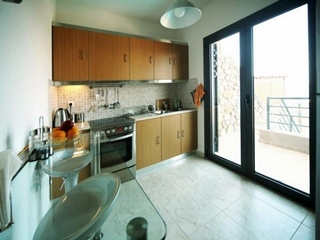 A spacious two bedroom apartment only a short walk to the beach and to the resort center of Sissi, Lasithi, Crete. It needs a little work but at this price !!!! 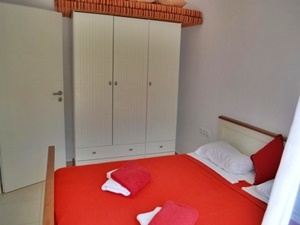 The apartment is equipped with A/C and central heating (radiators in all rooms). Sissi is a popular resort with lots of shops, restaurants, cafes, bars, super markets. pharmacies. doctors offices, etc. 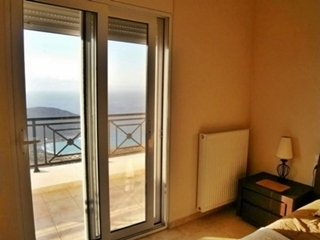 The apartment is less than 100 meters from the sea. 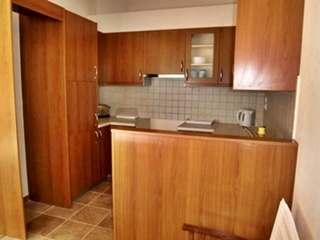 The 72 square meter ground floor apartment is separated by two half floors. On the lower floor there is an open plan living room/kitchen and a bathroom. A few steps lead up to the elevated area where there is a double bedroom, a single bedroom, an office space and a WC/washing room. At the front and back of the apartment there are two good sized terraces. 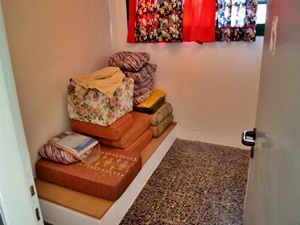 A storage room at the basement of the building belongs to this apartment. 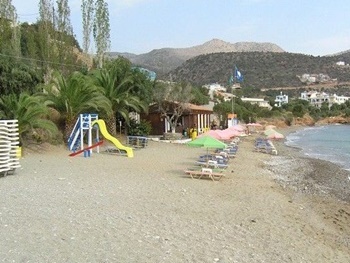 It is only a short walk to the Boufos beach and to the resorts restaurants, shops, bars, pharmacy, doctors office, etc. 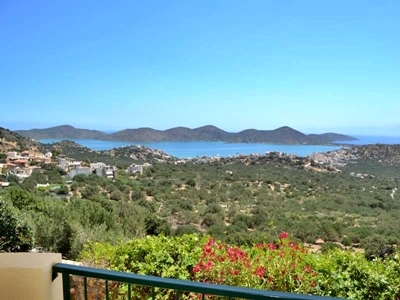 Set near the village of Kavousi this magnificent property overlooks the sandy Tholos beach from an elevated position that offers panoramic views of the whole of Mirabello bay. 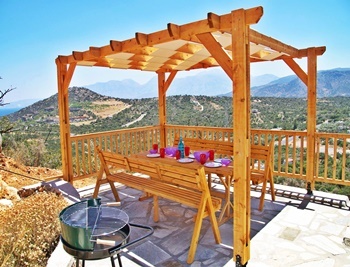 The house has many terrace spaces which can be used as sunbathing, BBQ, and dining areas. 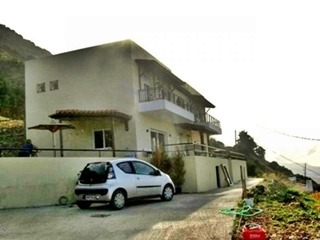 The property has a private ground of 2,000 m2 it has its own parking spaces and large paved areas around the house. There is enough space on the property to build a swimming pool. This newly built house comprises of on the ground floor , a fully fitted kitchen, a large living / dining area with lots of light and great views a storage cloak room and a study area. 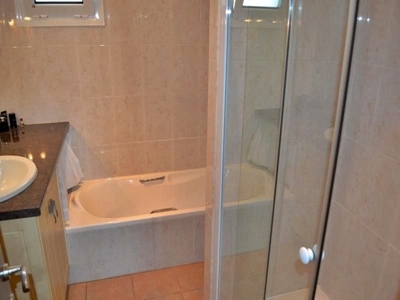 On the first floor are two double bedrooms with fitted wardrobes and balcony access and a shower room. 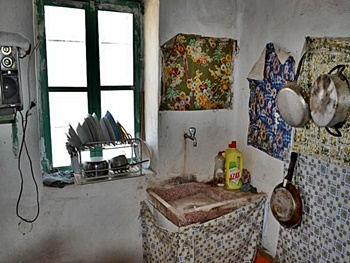 It has its own boiler for central heating with radiators in all the rooms, double glazed aluminium windows and doors, mosquito nets and all connections for air conditioning telephone and cable. 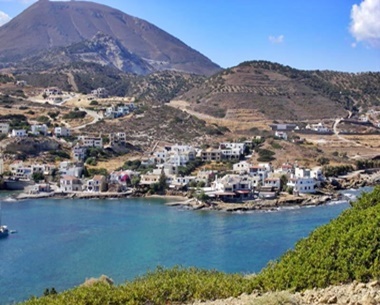 Kavousi is a coastal village with many shops tavern's and the lovely sandy Tholos beach is only a few minutes drive away. 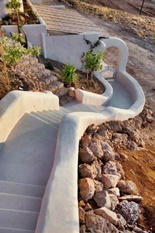 This is a large (180 sq meters), renovated stone house on the top end of the village of Mavrikiano, Elounda. 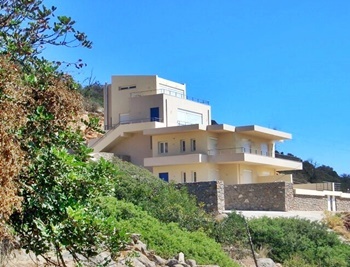 The house stands on two floors, on private land of 190 square meters. 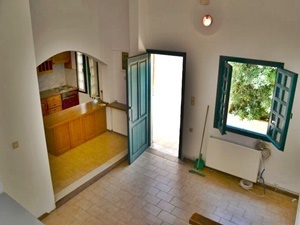 On the ground floor there is a large room split with traditional Cretan arches, this room is now the kitchen, living room, a study and a small paint studio, a double bedroom with wardrobe and small patio, a bathroom and a storage room. An internal staircase leads up to the first floor. The first floor comprises a large open plan living room/kitchen, a double bedroom with wardrobes and a good sized balcony with great views, a shower room and a mezzanine bedroom in the open plan living room. There is also a very nice balcony going along the front of the 1st floor. 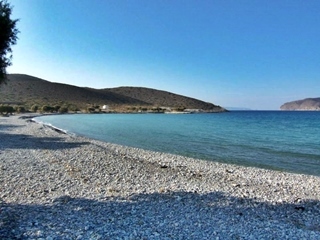 Mavrikiano is a small village part of the complex of villages that make up the tourist resort of Elounda. 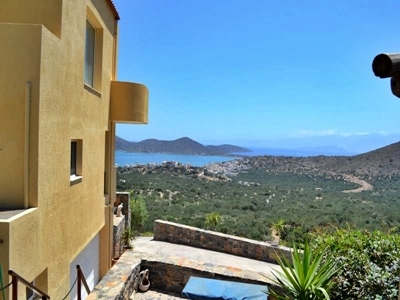 It is known for the many stone houses and the marvellous views over the Elounda lagoon and the lower village of Schisma Elounda : The property is only a few minutes walk to the sea. 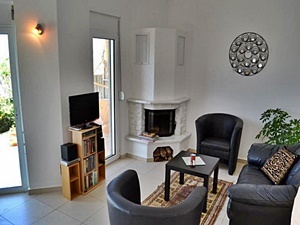 : The international airport of Heraklion is less than an hour drive from the house and it is only a ten minute drive to the provincial capital Agios Nikolaos, Crete. 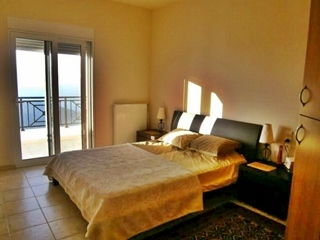 This is a 2 bedroom apartment situated just 2 kilometres from the modern tourist town of Agios Nikolaos Crete, and it is a two bedroom apartment Only short walk to a beautiful sandy beach. 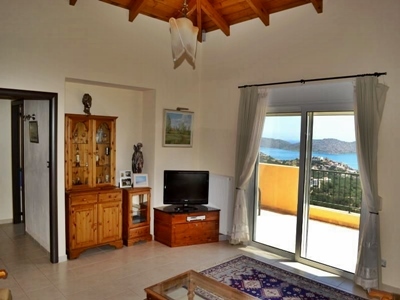 The apartment is in very good condition and comprises a large open plan living room/kitchen, 2 bedrooms, a shower room and a large balcony with fantastic views of the beach and the Mirabello bay. 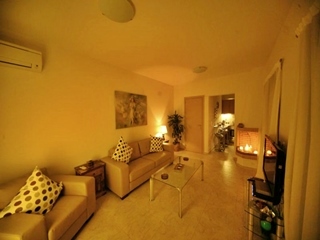 The apartment also has its own garden as well as parking space and central heating with radiators in all rooms. The apartment has solar panel/emersion water heating system. Double glazing and aluminium shutters in all balcony doors and windows, and there are wooden floors in the kitchen/living room and corridor. 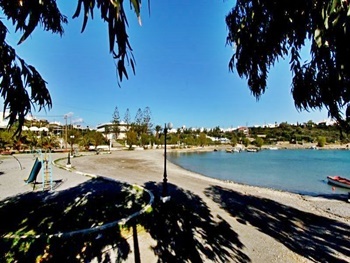 Agios Nikolaos is the capital of the county Lasithi and is located at the Mirabello Bay, north-east Crete, only 40mins away from the international airport of Heraklion. Geographically the town is well protected from strong winds allowing sea sports and swimming nearly all year round. Although Agios Nikolaos has a population of less than 20,000 it has a several banks, supermarkets, shops of every kind, doctors, a modern hospital of high standard, public swimming pool and tennis courts, yacht marina, harbour, cinema, theatre, gyms, a 9-hole golf course, schools ranging from nurseries to 6-level high school and generally all the amenities you would expect to find in a large modern European town. The microclimate is one of the best in Greece and the moderate temperatures rarely exceed 30c in summer or fall below 15c in wintertime. 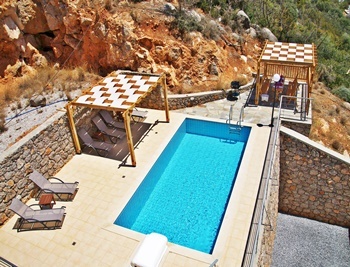 This wonderful dry climate together with the natural beauty of the area has attracted most of the high class hotels of Greece to operate here. 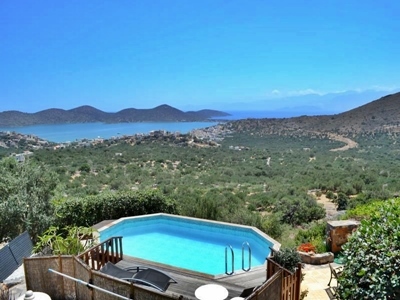 Being placed Only 200 meters from the shore, 150 meters above sea level, in the middle of an olive tree orchard, this luxurious single level villa completed in 2013 offers privacy and breath taking views over Psira island and Tholos bay. 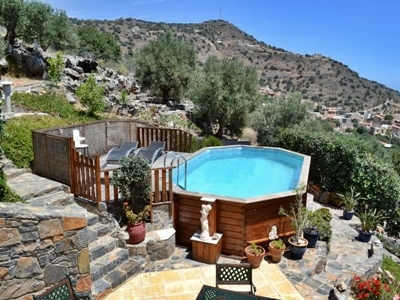 It is a first class property with terrace pool and Jacuzzi that has not been used since completion. 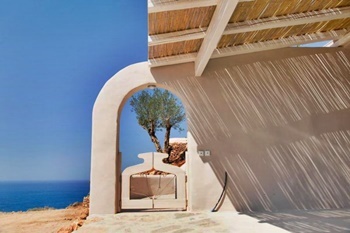 The villa follows the unique Cycladic architecture, organic and authentic in its nature, with functionalities suited to modern living, thus being an ideal choice as a holiday retreat or permanent family residence. The villa is built on 1200 sq. 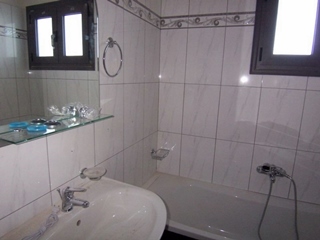 meters of private land and has 100 sq. meters of interior spaces, consisting of 3 bedrooms, 3 bathrooms (2 ensuite bathrooms), independent kitchen and a living room. 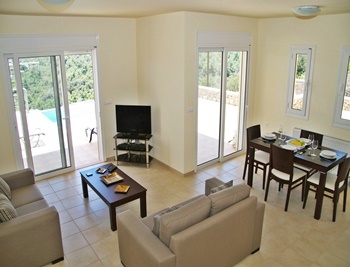 The living area together with one bedroom enjoy a vast opening on the pool terrace. 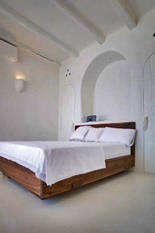 You can actually admire stunning views over Tholos bay at night from the comfort of the bed. 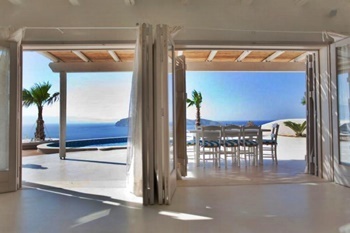 The folding doors can be fully opened to create an effectively continuous internal / external living area. The second bedroom benefits from a wonderful garden opening. All shutters are made of the beautiful and durable Niangon wood, changing their white colour throughout the day from intense white to rose-beige. 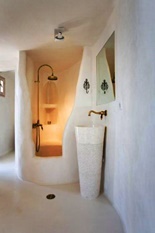 The charming bathrooms display curved forms, putting emphasize on the simplicity and purity of the materials incorporating exclusive fittings and fixtures. 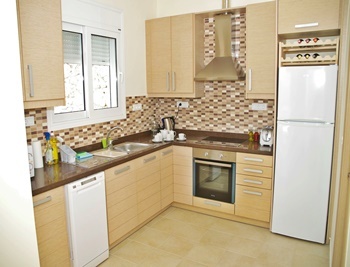 The fully equipped kitchen has an authentic design, enjoying both garden and sea view. 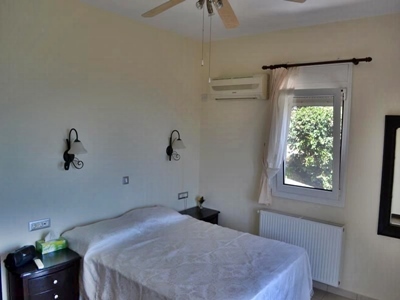 Separated from the main villa, there is also an annex composed by one bedroom with ensuite bathroom, an area for storage, utility room, and a large covered car port. 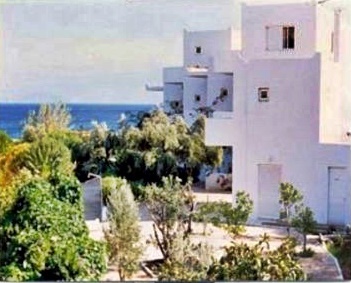 Making the most out of the natural landscape, the exterior garden was designed by a Cretan landscape architect, combining decorative plants with scented spices and fruitful trees in order to enjoy fruits and flowers all year round: olives, oranges, mandarins, lemons, figs, mousmoulia (a type of peach), pomegranate. 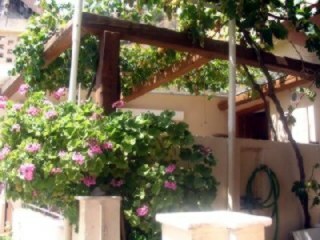 An automatic watering system ensures the daily watering of the plants and trees. 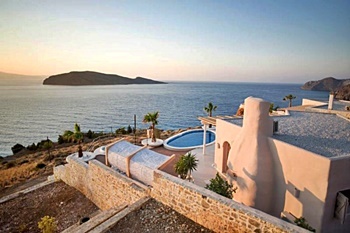 This beautiful villa looks over one of the amazing bays of Istron. The golden sanded beach is just 100metres away. 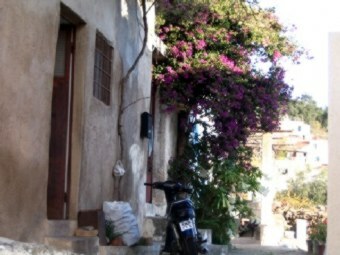 The village of Istron has tavernas, bars and small shops. 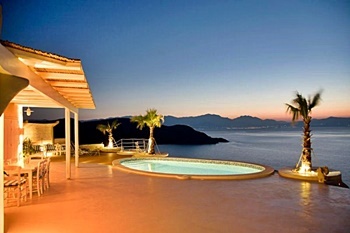 The cosmopolitan, tourist resort of Aghios Nikolaos with all its amenities is only a 10 minute drive. Built on a piece of land approx. 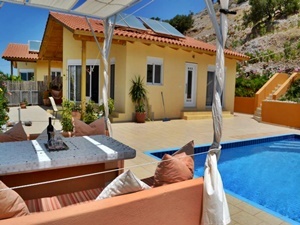 290m2, this is one of a complex of 3 villas. The 223m2 house comprises a ground floor, first floor and basement plus, 26m2 of semi-outdoor spaces, 51m2 of terraces, a garage and the large garden. 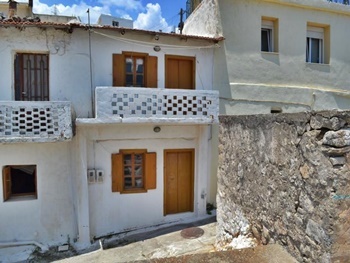 The ground floor : 69m2 with a large living space with a fireplace; kitchen; guest bathroom (with toilet and sink); staircase to the first floor; staircase to the basement; semi-outdoor space (20m2) by the main entrance; rear courtyard (9.5m2); large terrace (22m2) leading to the gardens. 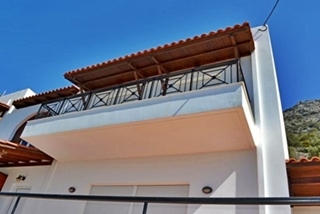 The first floor : 70m2 comprising one master bedroom, en-suite with a full sized bath and access to a large terrace of 20m2 : a second bedroom and a second bathroom with shower. 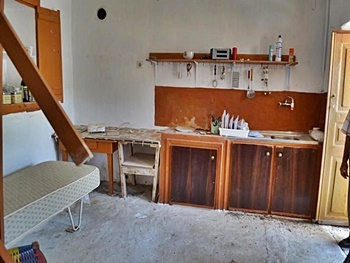 The basement : 92m2 comprises a boiler room; store rooms; garage; utility area; a bathroom with shower; a small semi-outdoor space (7m2) : A play-room; another room which, as an option and at extra cost can be converted to a bedroom. 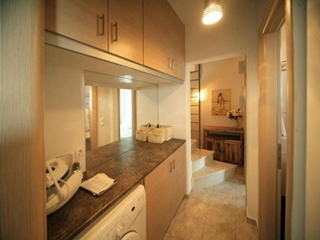 The basement has an independent entrance , therefore can also be used as a self-contained guest apartment of 60m2. 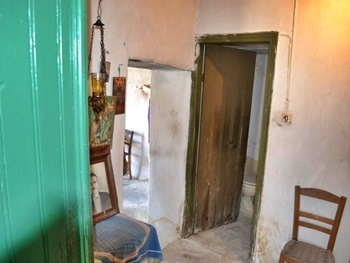 This is an old stone house in the village of Kalo Horio, Agios Nikolaos, Crete in need of renovation. 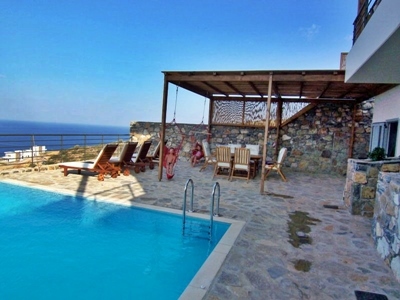 It is in the settlement of Pirgos, Kalo Chorio and it is only 1,5 kilometres from the sea. 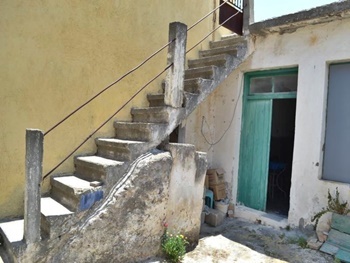 The house is a two storey building and comprises two rooms and a toilet on the lower floor and four rooms on the upper floor. 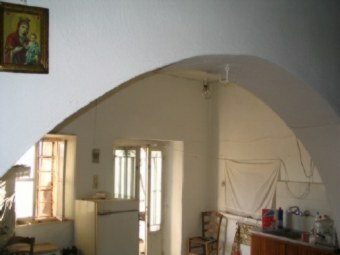 It could be easily renovated into a comfortable 3 bedroom house. Half of the roof of the house is flat and could be made into a roof terrace with sea views. Known for its spotless sandy beaches Kalo Chorio is a small tourist resort only 7 minutes by car from the province capital, Agios Nikolaos. There are shops, super markets, bakery, butcher shop, cafes and taverns which stay open all year round in the village. 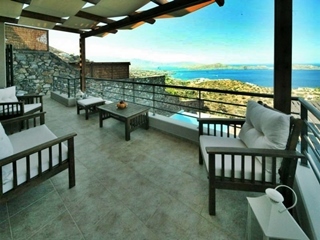 It has an undisturbed view of the "Island" of Spinalonga and is adjacent to very quiet country road. 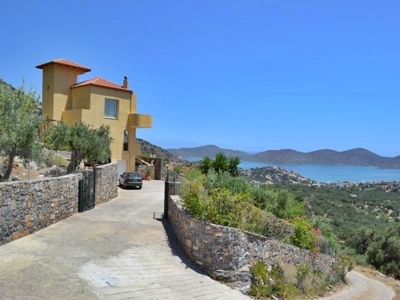 It is only a two minute drive from Plaka, and only five minutes from Elounda. 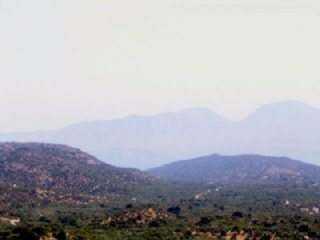 Good land to work on, not rocky, and easy to excavate if needed, the water, electricity, and phone are nearby. 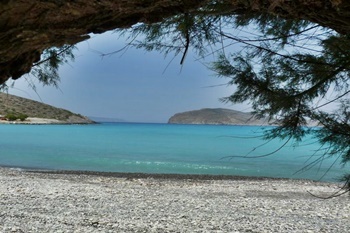 Crete The Best Climate In Europe. 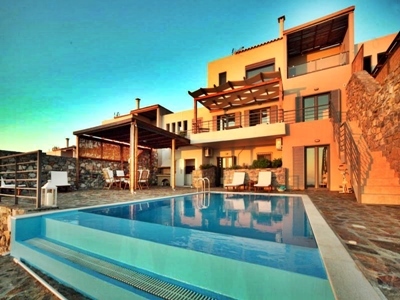 A detached stone villa with sea views, overlooking the coastal village of Milatos, Agios Nikolaos, Crete with established garden, covered parking and a swimming pool with its very own pool bar. 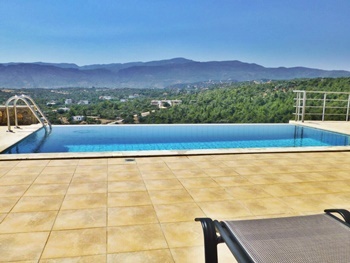 The property was built by its current owners in 2006 to be used as a permanent residency so the materials and craftsmanship is of a very high standard. The 135 square meter house is built on a private, walled plot of 885 square meters. It stands on two floors. 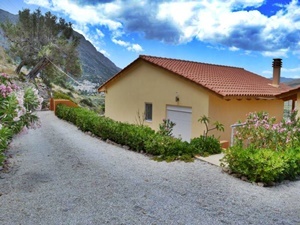 The ground floor consists of a living room, a fully fitted kitchen, a dining room which is used as an extra bedroom in the summer as there is a large covered dining room by the swimming pool which is ideal for the long Cretan summers and a shower room with a “Jacuzzi” shower system. A pretty staircase with wooden steps leads up to the top floor. 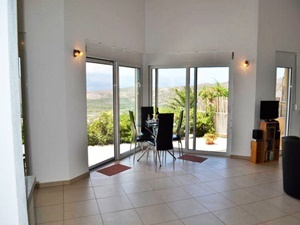 There are two double bedrooms (both with sea view balconies and wardrobes), a large bathroom and a covered terrace looking on to the mountains, on this floor. Outside there is covered parking for two cars, a BBQ area, a covered dining area, a fresh water swimming pool With its own pool bar with underwater bar stools and semi tropical gardens. 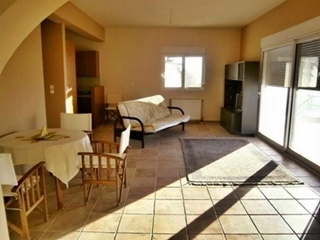 There are air conditioning units in all bedrooms and living room. Pipes for central heating have been pre-installed in the villa. There is a Solar panel water heating system. The sea and beach are only 1,5 kilometers from the villa, and it is only 40 minutes to the international airport of Heraklion, Crete. 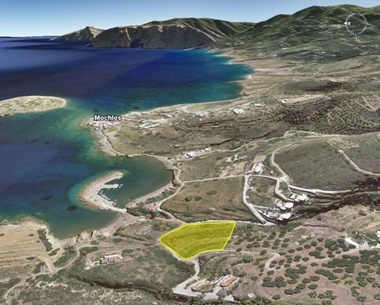 This is the sale of a 3 bedroom villa in the very desirable location of Elounda. 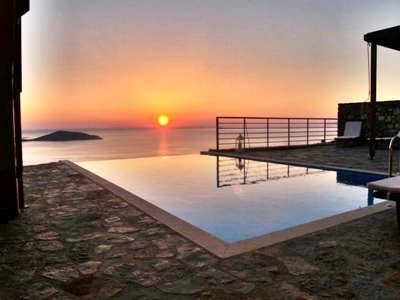 Offering beautiful views of the Mirabello bay, the Elounda peninsula, Spinalonga Island and the Cretan Pelagos, it also overlooks the luxurious Elounda Beach hotel, one of the Leading Hotels of the World. 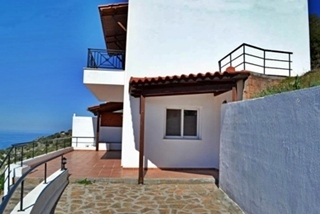 The actual property consists of a 3 bedroom 3 storey villa, with a private pool of 24sqm with lots of space for sunbathing, a barbecue area, a large garden and 5 private parking spaces, 2 of which are sheltered. On the ground floor there are two double bedrooms with fitted wardrobes and access to the swimming pool area and a good sized bathroom. There is also quite a lot of storage room on this floor. A marble staircase leads to the first floor..
On the first floor we find the houses main entrance. There is a living room with a fireplace on this floor and a fully fitted kitchen with wooden worktops and cupboards. There is also a large balcony on this floor with stairs to the pool area. On the second floor there is an amazing bedroom (offering stunning views) with en suite shower room and a covered balcony. 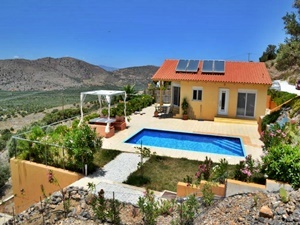 The villa has solar and emersion water heating system. 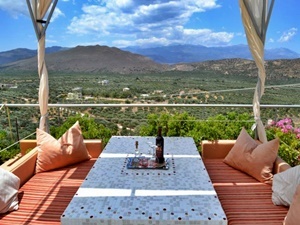 The design of the villa and its grounds offer great privacy without blocking any of its wonderful views. 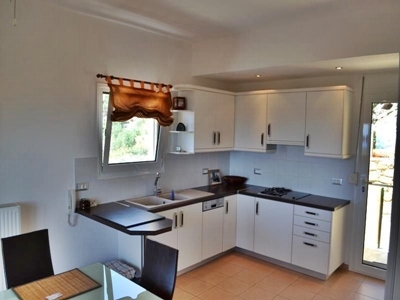 This property has great rental potential as it is in an area with large demand for luxury rental villas. 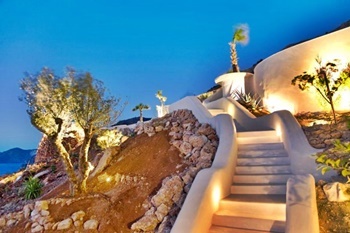 However it could be a luxurious private villa. 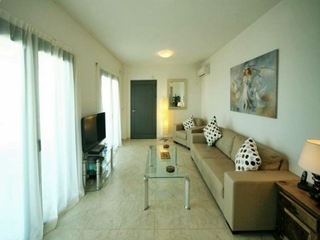 It is fully furnished with top range furniture, and there are high quality air conditioning units in all rooms. 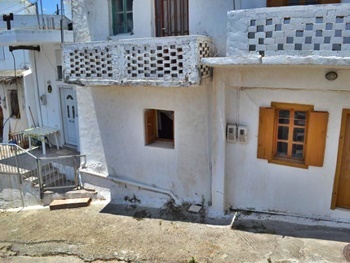 This lovely little house is on the highest part of the traditional village of Kritsa and the scenery is outstanding. 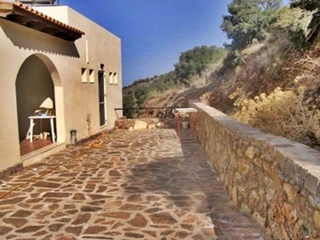 This property has been totally renovated in keeping with its original Cretan traditional style. The 45sqm house comprises of 1 bedroom with wooden beamed ceiling, open sitting room/kitchen, bathroom and a pretty courtyard of 12sqm. It is possible for a second bedroom to be constructed on the top of this house. 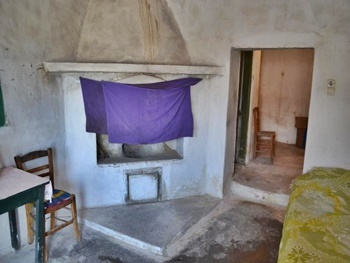 This is an old village house of 45sqm comprising of a living room/kitchen, bathroom and a bedroom. 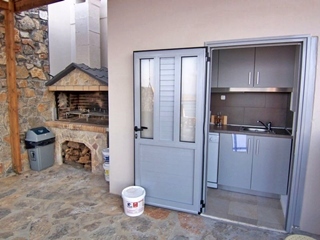 An adjacent building of 15sqm and a garden area of 30sqm. The 2 buildings are very close as they are separated by a country lane. The extra building could be used as a guest room or work room. 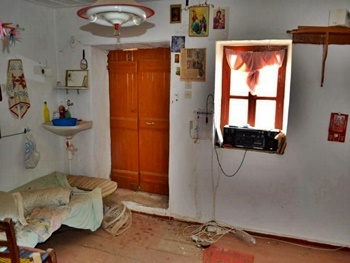 The property is in need of renovation but the house is habitable and has electricity, water and a sewage system. 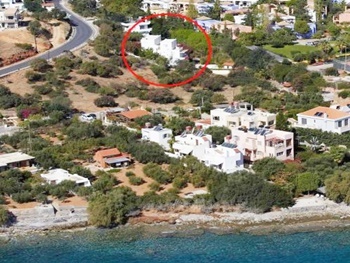 This property is the second last house in this country lane and the road and parking are just 20 meters away. There are great views from this site of the valley bellow and the village. 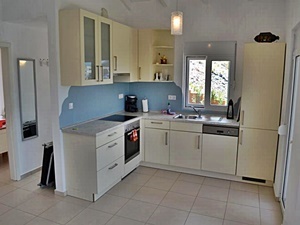 Set in the pretty village of Kalo Horio (just 1.5 kilometers from the 3 sandy beaches of Istron) this 2 storey house has been renovated into a comfortable 2 bedroom home. On the ground floor, there is a 15sq meter front covered yard and an external side staircase leading up to the first floor terrace. 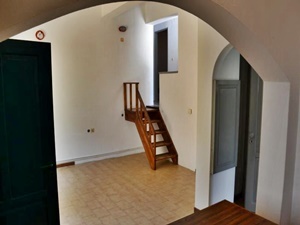 Inside there is a living room, a double bedroom, and an internal wooden staircase leading up to the first floor. On the First floor, there is an open plan kitchen/dining area, a double bedroom and a spacious shower room with washing machine. A door from the dining area leads out onto a wonderful first floor terrace which is used as the summer breakfast and dining area. From this terrace a metal spiral staircase leads up to the roof terrace. 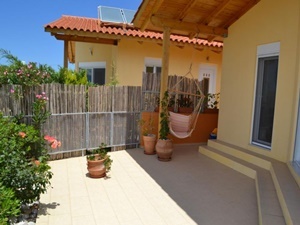 Half the roof is used for utilities (like a solar panel water heating system, satellite dish and storage) and the other half has been made into a covered roof terrace which enjoys great views of the Kalo Horio nature and the sea. 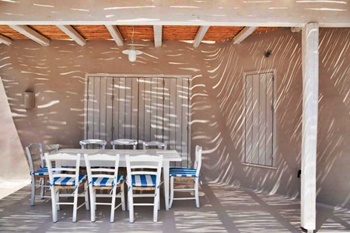 The house has been renovated to a very good standard using top materials without losing its Cretan traditional character. 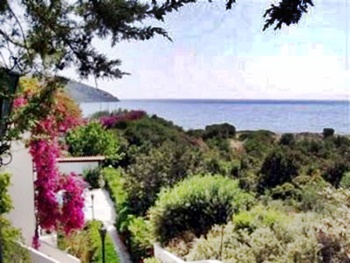 The house is only 1.5 km away ( 10 minutes walk ) from some of the most beautiful sandy beaches of the Mirabello Bay. 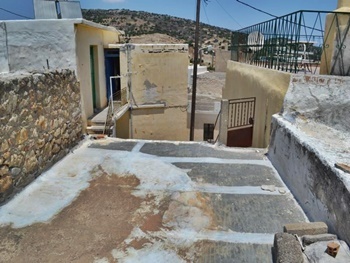 Kalo Horio is the name generally given to three smaller areas Istron, Pyrgos and Arnikou. This area is situated between beautiful sandy bays and magnificent mountains about 10km south of the cosmopolitan town of Agios Nikolaos. It offers many amenities and there is a strong local community plus a few foreign residents in the area. This allows the local shops a 12 month a year business rather than just summer season openings. Thousands of visitors come to Kalo Horio to visit its three lovely beaches Aghios Panteleimon, Karavostasi and the golden beach of Voulisma. There is a very good bus system connecting Kalo Horio to the rest of the island that operates on an hourly basis. 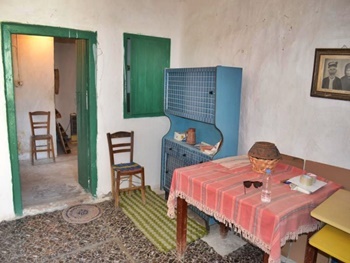 This house is located in the lovely village of Pirgos, Kalo Horio, Only 1,5km from some of the most beautiful sandy beaches in East Crete. 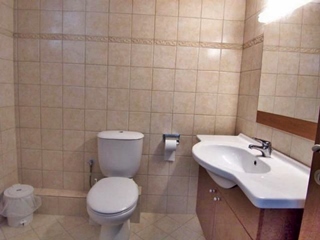 This pretty house is a total of 78m2 on two floors, positioned on a plot of approx 125m2.. 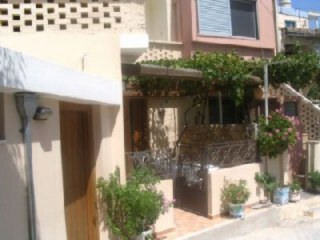 Originally built in 1974, but fully renovated in 2008, this house is in excellent condition and is ready to move into. 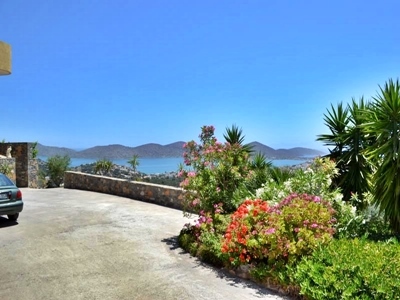 The garden of 55m2 and the terrace of about 20m2, offer this property some wonderful exterior spaces. 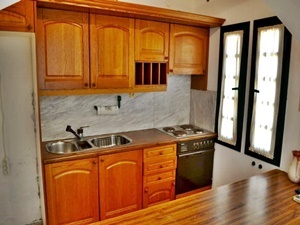 On the ground floor, there is a fully fitted kitchen with dining table and a wood burning stove. A living room with corner gas fireplace (gas bottles). 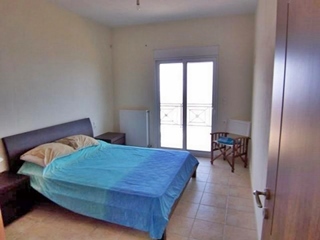 There is a double bedroom with fitted cupboards, A shower room. A wooden staircase leads from the bedroom up to the top floor. 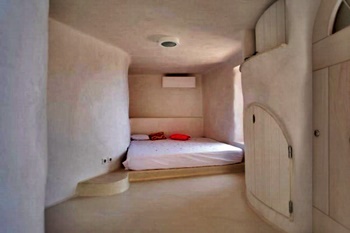 On the first floor, there is a double bedroom with a W/C. A sitting area with glass wall. A side door leads from the sitting area out onto the terrace. 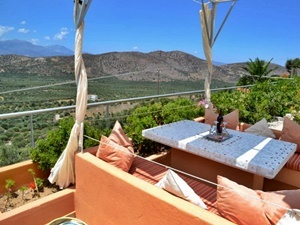 The exterior, has a terrace with great views, a garden of 55m2 with many flowers and some fruit trees. 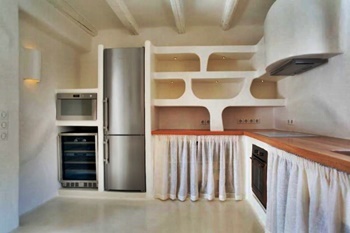 There is a small kitchen for serving outside and a storage room. 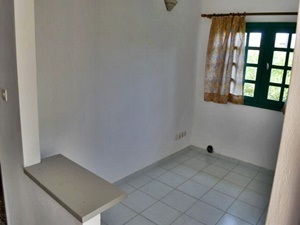 The house also includes : Air-condition units in the living room and the top floor bedroom. 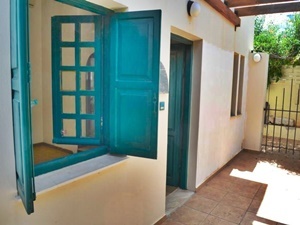 All doors and windows are aluminium double glazed with shutters, and there is a solar panel for water heating : Direct road access to both levels of the house (front and back). Easy parking. Kalo Horio is the name generally given to three smaller areas Istron, Pirgos and Arnikou. This area is situated between beautiful sandy bays and magnificent mountains about 10km south of the cosmopolitan town of Agios Nikolaos. Thousands of visitors come to Kalo Horio to visit its three lovely beaches Agios Panteleimon, Karavostasi and the golden beach of Voulisma. There is a very good bus system connecting Kalo Horio to the rest of the island that operates on an hourly basis. The international airport of Heraklion is about 55min drive from here..
BACK TO HOME PAGE BACK TO PAGE 1 BACK TO PAGE 2 BACK TO PAGE 3 BACK TO PAGE 4 E MAIL BRIAN.